Get ready to enjoy zucchinis like you have never enjoyed them before! 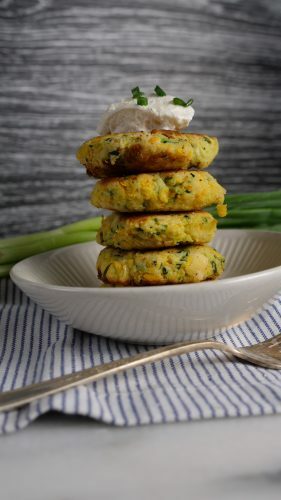 These zucchini fritters are keto friendly since they are made with almond (or coconut) flour and are super delicious and healthy! This is the best time of the year to make them too since zucchinis and summer squash are popping up everywhere from our gardens to the farmer’s market! 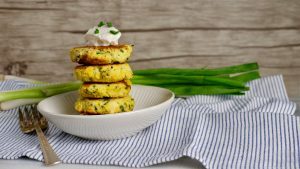 You can make this recipe with any kind of squash you can find – green zucchini, yellow zucchini, patty pan squash! The choices are endless. Something to keep in mind for the recipe is that you really want to squeeze out as much of the water as you can from the shredded zucchinis or the fritters will not stay together. I shredded it the night before, added the salt and left it in the fridge in a colander over night. Then right before I made the fritters, I squeezed the zucchinis with a cheese cloth to get any remaining liquids out. If you find your mixture a little wet still, you can add more almond of coconut flour to bind it together. Use your judgement. If you cannot form a fritter and its falling apart before you even cook it, it is probably too wet and need more almond or coconut flour! These fritters are gluten free, low carb, keto friendly and still delicious so everyone can enjoy them! They are definitely a crowd pleaser! Hope you give them a try for your next potluck or BBQ! I guarantee you will love them! Form zucchini mixture into fritters. I did them at 1 inch in diameter. But you can make them whatever size you like. Cook on each side for about 2 minutes or until they turn golden brown. I love zucchini fritters and appreciate this gluten-free version! I agree, the zucchini need to be dried so you don’t have soggy fritters. Nice job! I have never had fritters! Your tips are so good for getting all the moisture out of the zucchini. When our neighbor gives us some of his surplus zucchini, I know what I’m doing with it! Theses are so cute and look so tasty, too! I love making these. I am impressed with how thick yours are as mine are quite a bit thinner. These look wonderful! I love making fritters like this! Yours came out so beautifully! Wonderful recipe. Made these for a BBQ yesterday using coconut flour. Absolutely incredible, I couldn’t be happier with them! I’m going to keep these on hand weekly. Thanks so much!